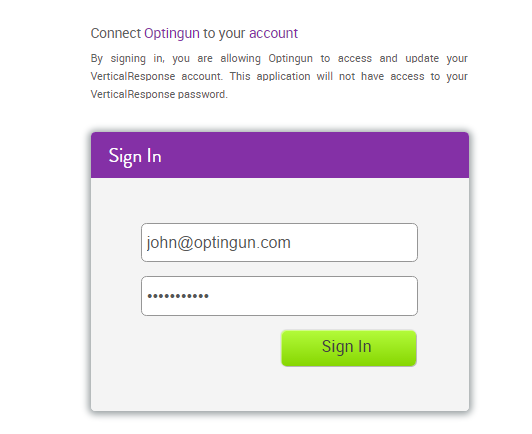 Integrating your Optingun forms with VerticalResponse is super easy, its takes only 2 steps to finish the whole process. Go to your forms or create new form, and navigate to Integrations tab using the left side menu, and from email software selector, select VerticalResponse, this will connect to VerticalResponse in real-time and load all the groups that are available there, select the groups that you want to add contacts to and click on "Add Integration" button, now you should see the rule description on right side tab, after this, update your form by clicking the green button on left side menu as shown in the picture below with numbering. This is all you need to do to connect your forms with VerticalResponse, enjoy using it.